I have a question did anyone have any luck removing the in-dash speaker and replace it without removing the dash. does anyone out there have any experince or knows if it can be done without removing the whole dash out of the car. I changed mine almost 20 years ago but from what I remember is I removed the HVAC controls and I was able to reach the screws by squeezing my hand and arm through the hole. You could probably remove the gauge cluster and you might be able to reach the speaker. I was a lot more bendable back then so I'm not sure I could do it the same way again. thanks, I believe the far screw to the passenger side it not reachable through the gauge side, wondering how I can reach that one. What kind of special tools or sockets did u use ? I used a mini ratchet with socket. and the passenger side screw i went through the glove box. What seat ? Why ? It's because I like laying down on the job !! Yeah, it can be done. I did it last fall. Remove the underdash ventilation ducts. Remove ashtray & glovebox door & insert. Remove the middle AC vents. 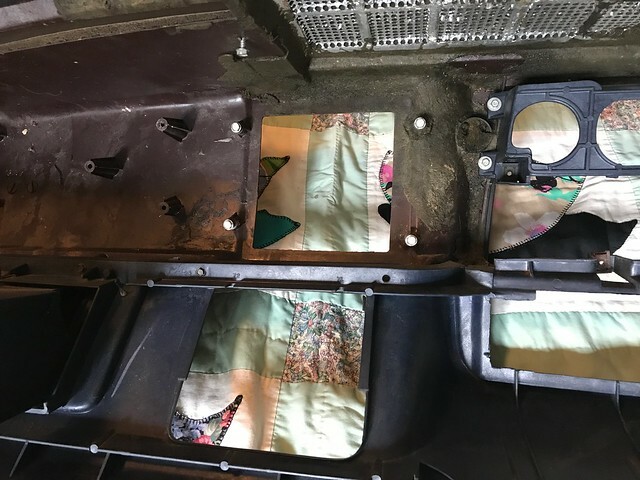 With these items out of the way, you will be able to reach up behind the dash & disconnect the speaker wires & remove the two nuts holding on the dash speaker mount bracket. (You'll have to lay on your back & look up to get a good look at it). The RH side is easiest to reach through the middle AC vent hole. The LH side can be reached through the same hole, but you might also be able to reach it from under the radio/hvac control unit with a long extension & 5/16" socket (iir). Once you remove the bracket nuts, you can slide the speaker to the right and then either lower it on the rh side of ductwork, below ashtray/glovebox. I didn't know that the centre ac vent can be removed? There are 4 screws holding it on from the back side. Pita to reach & remove, but if your patient (smaller hands help too), you can reach them. Caution - the little plastic tabs that hold it to the back side of dash get brittle with age. TW Monte wrote: There are 4 screws holding it on from the back side. Pita to reach & remove, but if your patient (smaller hands help too), you can reach them. Caution - the little plastic tabs that hold it to the back side of dash get brittle with age. I just did mine on my 73. Did pretty much what these guys said only thing was for what ever reason the little nuts would not thread back on the studs that hold it in place.I had to go to the hardware store and get new ones.It was like they were single use only. Probably so it would not loosen up and make the radio sound bad. Just happen to have my dash right here so snapped a picture for reference. You can see the four screws holding the center vents and one screw that holds the speaker mount. crice63 wrote: Just happen to have my dash right here so snapped a picture for reference. You can see the four screws holding the center vents and one screw that holds the speaker mount.